The Woman in Black Facebook page has updated with a message to all fans who would like Daniel to answer their questions about working on The Woman in Black (It's part of the promotion for the upcoming The Woman in Black DVD & Blu-ray release). Read more about a chance to let that happen below. Daniel fans! Want to have Daniel answer your questions? Between now and April 24th, use your webcam, smartphone, bloggie or camcorder to tape yourself asking Daniel your most pressing questions about his experience working on The Woman in Black. Post to our Facebook video section and we’ll select some of our favorite questions to show to Daniel. 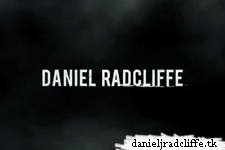 Check back with us May 14th to see if Daniel answered your question! Hi Lauren! thanks for the comment, but to join you should tape yourself and post the video to the video section of TWIB's Facebook page. (see above) Good luck!